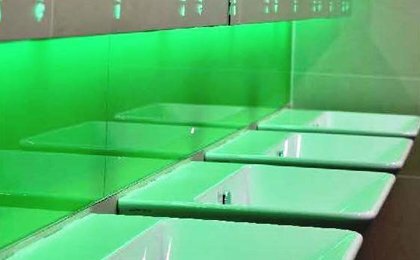 When space is at a premium and energy efficiency is a priority, this modular, touch-free, behind mirror hand-wash system from Dolphin has all the answers. Designed with input from architects, designers and clients. Alavo uses the latest technology – including infra-red sensor taps, foam soap systems and high-speed low energy dryers. Quick to install, easy to replenish, and a pleasure to use. 1.0kw high speed hand dryer, drying hands in 13 seconds. This dryer uses up to 70% less energy than conventional hand dryers, saving money for your clients. A warning light shows when paper towels are running low. These can be interchanged with hand dryers. The module only requires a hot and cold water inlet. The connection fitting to the module will require a 15mm pipe for each hot and cold water inlet. Seven liter soap tank allowing 17,500 hand washes. 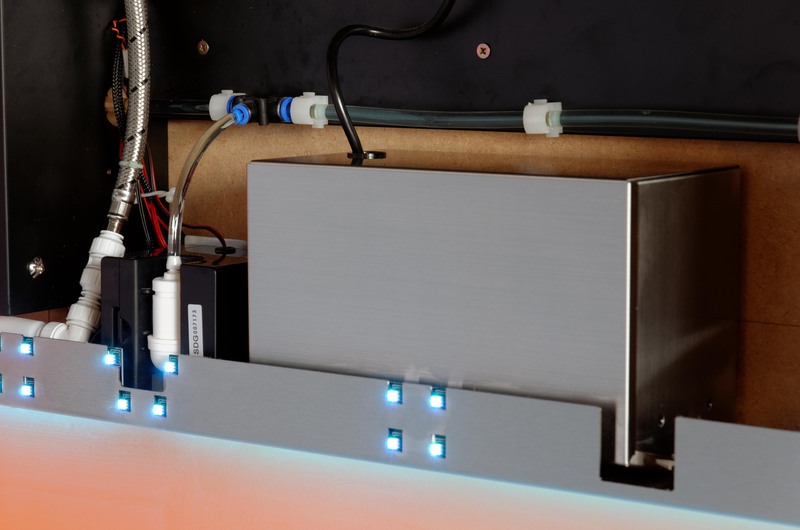 The soap tank is fitted with electrodes which measure the level of the soap. 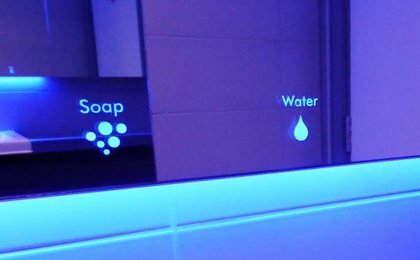 When the soap level drops to 2 liters of soap left, a "Soap Low" light message will appear on the top left-hand side of the mirror. Long life, energy efficient, ecologically friendly, durable quality, design flexibility, operational in extremely hot or cold temperatures, very good light dispersement and low voltage. The LED lighting colour by the RGB adjustment switches in the consumer panel. Check out this cool video. Click watch on Vimeo to view.